In the world of acting, Andy Serkis stands nearly alone in representing the growing field of motion captured performance. While his name may not be well known to many households, his characters certainly are; they include Gollum in “The Lord of the Rings” film trilogy, King Kong in the 2005 remake, Captain Haddock in “The Adventures of Tintin” and Caesar in “Rise of the Planet of the Apes.” What these characters all have in common is that they are all computer-generated characters, to which Serkis provided the crucial human elements of voice, body movements and facial expressions. His performance as the ultra-intelligent chimpanzee Caesar, whose safe and privileged upbringing in his human foster family suddenly changes to a brutal prison environment, caught the attention of many who praised Serkis’ nuanced skill in this portrayal. As a result, the Santa Barbara International Film Festival honored him, along with five other outstanding actors and actresses, with the 2012 Virtuosos Award, which recognized exceptional and standout performances in this year’s wide array of films. Not one to take all of the credit, Serkis praised his fellow award winners and the team of technical experts who helped him “create” Caesar. While many have lauded his work, some critics wonder if performance capture is deserving of the kind of recognition usually given to “normal” acting. Until performance capture began to emerge as a useful technology in film acting, most computer-generated films lacked the realism and truthfulness found in live action films. Before the technology, computer-generated characters often seemed uninterested, detached or indifferent. 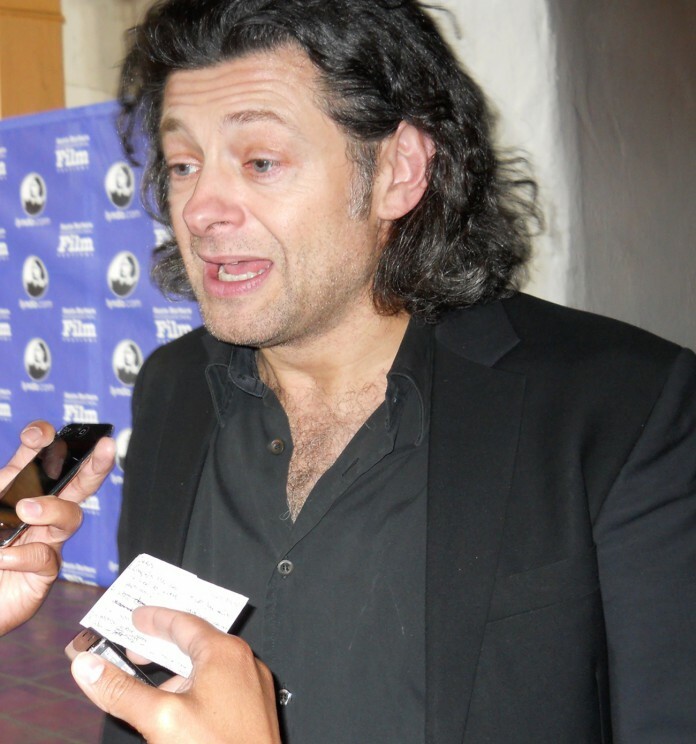 However, with the rise of performance capture, which has been tied closely with the rise of Serkis’s acting career, characters like Caesar, Kong and Gollum have begun to connect with audiences and critics in the same soul-touching way that the award winning performance of a live actor captured by standard cameras can. With the Virtuosos Award, Andy Serkis’s work may just begin to receive the widespread recognition of talent that the SBIFF, and his peers, recognized. While the SBIFF Virtuosos Award embraced rather than eschewed Andy Serkis for his distinction in motion capture performance, it also recognized other actors and actresses for their breakthrough performances. Honored along with Serkis were Demian Bichir (“A Better Life”), Rooney Mara (“The Girl with the Dragon Tattoo”), Melissa McCarthy (“Bridesmaids”), Patton Oswalt (“Young Adult”) and Shailene Woodley (“The Descendants”). The ceremony, held at the Arlington Theatre, began with yet another media swarmed red-carpet event, which glamorous as it was, held no comparison to the entertainment that was the ceremony itself. Actor after actor one-upped another in comedic bursts during their speeches, such as when Serkis emerged from an onstage tunnel without his shirt, recreating his Caesar pose while bare-chested. Even actress Melissa McCarthy, who was unable to attend the event due to a sudden bout of laryngitis which left her unable to talk, left her own indelible impression on the crowd with a funny thank you note that said, “You all leave me speechless.” The night’s event, from its impressive ensemble to its high jinks and highlights, certainly left everyone breathless.